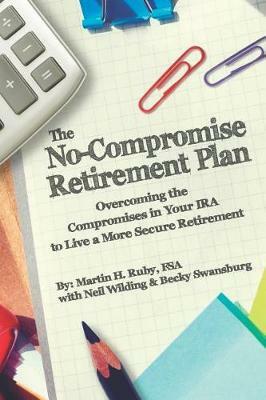 For any saver tired of making concessions when it comes to retirement plans, this book will give you the knowledge and confidence to live a No-Compromise Retirement. Market conditions and increasing lifespans have left many savers with uncomfortable decisions when it comes to ret... read full description below. For any saver tired of making concessions when it comes to retirement plans, this book will give you the knowledge and confidence to live a No-Compromise Retirement. Market conditions and increasing lifespans have left many savers with uncomfortable decisions when it comes to retirement. Compromise has become a necessity for financial planning ... but it doesn't have to be that way. The No-Compromise Retirement Plan is an innovative, analysis-based approach to overcoming the three biggest compromises you're making today, so you can live a more secure retirement tomorrow. Martin H. Ruby, FSA, has made his career helping people like you save smarter. As founder and CEO of Stonewood Financial, he helps savers achieve both greater financial wealth and greater financial security. What makes his approach so successful? Martin is an actuary, a mathematics specialist focused on identifying, evaluating and eliminating risk. In founding Stonewood Financial, Martin realized his vision of delivering actuarial expertise to clients rather than financial institutions. He uses his insider knowledge of how insurance and financial products work to structure strategies that maximize benefits for savers. Now, Martin has used his insights and expertise to develop The No-Compromise Retirement Plan. Reading this book will teach you how to overcome today's most common compromises and achieve the happy retirement you deserve.